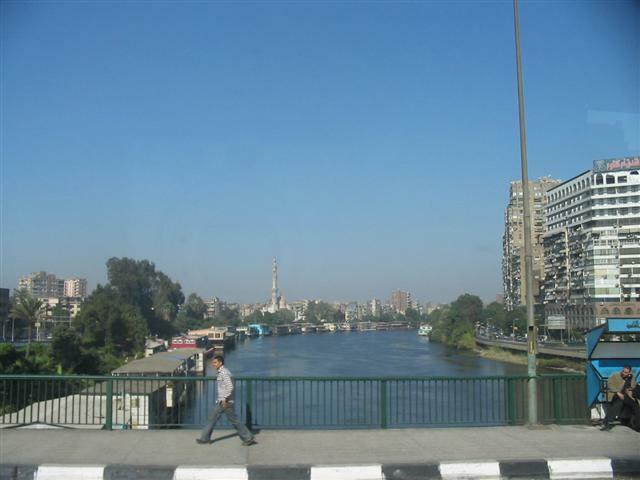 Cairo is a manic, mind-boggling mish-mash of a city. It’s incomparable. Rows of small ornamental trees are planted in old olive tins. Bored policemen in tall thin towers rest their rifles on ledges and watch the world go by. Traffic rushes madly past Saladin’s huge Citadel and men frantically sweep the roads and shops, fighting a constant losing battle against the sandy dust, while others sit all day in coffee houses, playing backgammon, or with a hookah in one hand and a mobile phone in the other. Hookahs are filled with shiska, the local tobacco, mixed with a flavour of their choice; honey, mint, apple, cherry. The hookahs are shared; very unhealthy, the women think. A Cadbury’s Dairy Milk factory sits alone, surrounded by slums and ornamental mosques. Minarets poke above blocks of flats with balconies heaving with washing lines. Loud speakers call everyone to pray five times a day. Thanks to modern technology the priest doesn’t have to climb the stairs any more. He stays on the ground with microphone in hand. A woman squats by the roadside with a sackful of lettuces and onions. She carefully pulls off the outside leaves and displays her wares artistically. Nearby a shop is closed, with only carpets over the doorway and windows to keep people out. Very trusting. Cars hoot. Two men on camels wait patiently in the traffic. I see three men clinging on to the back of a white van, a van with three cows tied behind, a man on a donkey, a man strolling along with a cow on a rope, a horse standing happily in the back of an open van, mane blowing in the breeze, a van piled high with bananas, a camel kneeling elegantly in the back of a van. It looks up at our coach with interest as we stare back. A mountain of cabbages with a van underneath swerves through the lanes of traffic. They didn’t seem to be tied on. Two lads on a moped carrying lengths of waterpipe, with bags of cement between them zig-zag dangerously. A woman dressed from head to toe in black squatted in the gutter and relieved her bladder and bowels in front of everyone. We all stared, horrified. She didn’t care. A boy on a bike wove his way along, steering with one hand and balancing a large tray of bread on the other. Further, a man swept the pavement and gutter, picking the rubbish up with his bare hands. He was in for a shock- or was he used to it? Outside a small house, a chicken walked up and down a rug on the ground. A rickety wooden stable filled with cows and goats was built next to the road in the middle of the city. A car had travelled the wrong way down the duel carriageway and brought all the traffic to a standstill. A policeman was writing down his details and everyone had got out of their cars to stare. Our convoy of coaches was waved across. 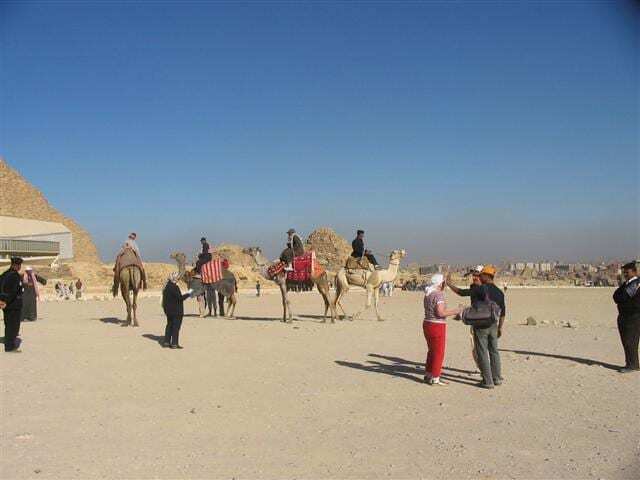 Tourism is treated with respect in Egypt. Cairo Museum has statues thousand of years old standing in the grounds. It’s hard to take in their age and value in such casual surroundings. Guides hold their signs in the air so we can spot them in the crowds. They lead us all to designated areas and talk on and on about one or more objects that hold no interest for us. The Rosetta Stone is a sore point. It’s in the British Museum. The Cairo Museum has a copy. The first rooms we’re taken to are the Tutankhamun rooms. Unbelievable! Oh the mask and the throne! Oh the jewellery! Oh the workmanship! It’s all well-known. Everyone’s seen the photos many times, but nothing can prepare you for seeing the real things. Tutankhamun was a minor king. Just imagine what was pillaged from the other tombs! We slip away like naughty schoolchildren. I’d rather see everything and read about it later. We hurry along on our own, staring from right to left. Nobody knows if there was really a Pharaohs’ curse, but I added mine to whoever carved graffiti on an ancient hieroglyphic-covered casket. You can reach out and touch some objects. Some people do. After seeing Tutankhamun’s belongings for the after-world, other objects and statues far older and probably more valuable lose their attraction. My advice is, save Tutankhamun till last. Our coaches cross the Nile, into another ambiance; a lush luminescent landscape of green, stretching to the clear blue horizon, broken only by scattered blocks of flats and perfectly-shaped palm trees. Men in long white traditional costume with headdresses on worked leisurely amongst the regimental rows of vegetables while tethered donkeys watched. Clusters of hideous red, abandoned-looking flats scar the surroundings. 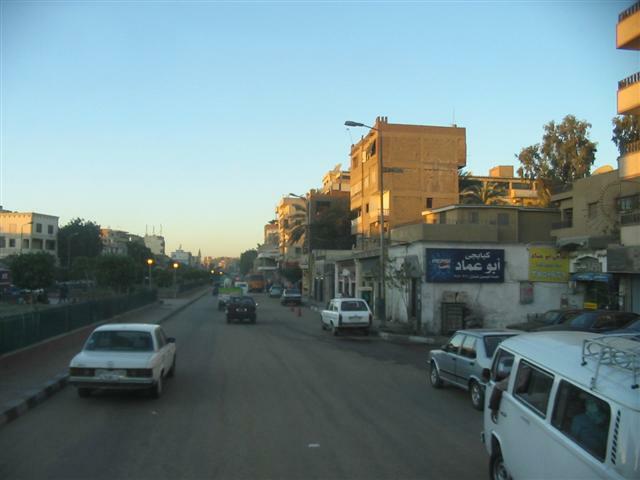 Many of the Egyptians invest all their savings in property for themselves and their children. When they have some more spare funds, they add to the building work. The carefully-finished blocks of flats, white with ornamental balconies, reminded me of a reversed contrast between how the Pyramids must once have looked and how they looked now. And then we caught our first tantalising glimpse of the Pyramids through a sandy haze before they vanished again behind rows of ugly unfinished flats. There are 9 Pyramids. 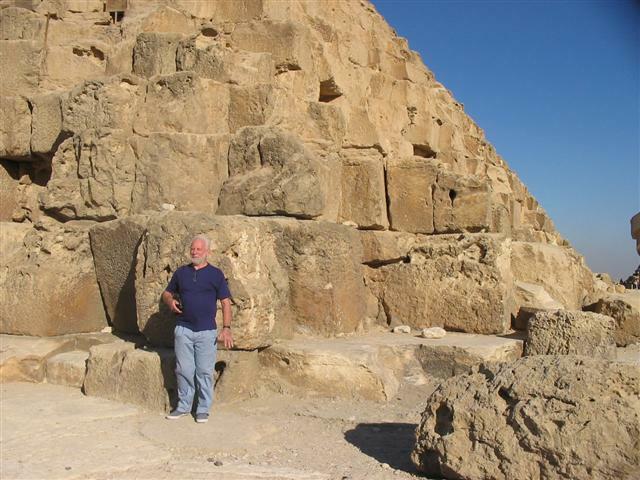 We visited the group which includes the Great Pyramid. They stand looming over the duel carriageway like- well what can I say that hasn’t already been said through the centuries? If I’m honest, they didn’t make me gasp. They looked as I’d expected them to look, although I’d thought they were further in the desert, not beside the road. We were greeted by gangs of grime-encrusted touts who materialised like ants at a picnic. They are an absolute pain in the neck. They try to shake hands and we back away from their filthy hands. Sometimes we’re caught out and I’m glad I packed the moisture wipes. ‘Where are you from? England? Luvely jubbly. Cheap as chips. Asda Price.’(smacking their back pocket.) Camel riders offer rides. Once on, they won’t let you off until you pay extra. Even the police there demand money for any contact with them. We refused and walked away. The middle Pyramid has a burial chamber that you can visit. I’d looked forward to it all my life. I walked down the steps and up to the entrance in anticipation- and I froze. The heat and a strong energy like I’ve never felt in my life hit me. I backed away and ran up the steps. Nearly everyone else went in, but every now and then, a woman would turn back. Suddenly the way was clear. The entrance is about 4ft high and wide enough for 2 people to pass. It goes downhill, then up and into a chamber about 19ft high. I went down again and looked inside. I’m a fearless tourist. I’ve been in caves and catacombs, up narrow staircases, anywhere- nothing’s ever bothered me. I really wanted to go in that Pyramid. But something blocked me from even putting a foot inside. We drove further on to see the Sphinx. It’s hard to get a clear view of it. The poor thing looks sad and worn. I was more impressed by the entrance to view it; enormous blocks of stone, bigger than 2 men. They look brand new, but they’re several thousand years old. It was impossible to photograph them as touts in strategic positions hid the view. Of course they’d be willing to move for a fee. A desperate filthy girl pleaded with me for ages to buy a set of postcards. It was late in the day and she obviously hadn’t reached her target. But I couldn’t help. What would happen to her tomorrow? Maybe her given target would be higher. On the way back to the coach the touts attacked in earnest. I ignored them and the prices went down drastically until they were great bargains. Shame. By then I’d lost interest. 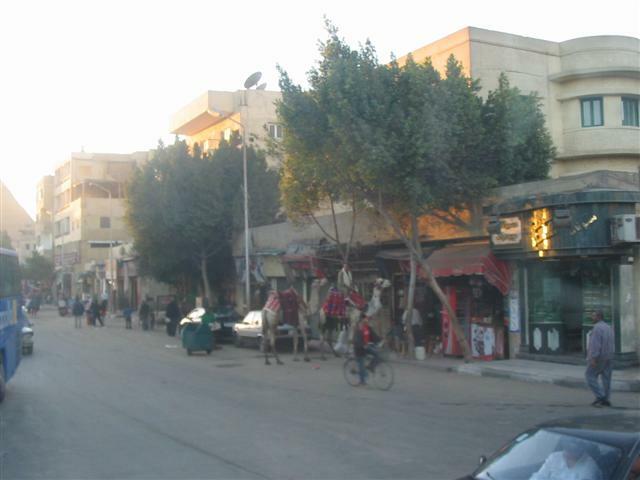 In the nearest back streets are groups of camels, donkeys and horses. A white van full of grass drops off food to all the animals who munch happily together while their owners disappear into the nearest coffee-house. Another day’s work is over.